I know I’ve been out of blogging mode for awhile, but we’ve been working on getting our house on the market – it will be for sale this week, just in time for us to fly to Seattle for a week. It’s been hectic. So, in light of that, I figure it’s time for a drink. And since my mint came up like crazy with the heat this week, I figured it’s mojito time. Not a lot of locals know that we have a rum and vodka distillery right here in Hampton Roads- Chesapeake Bay Distillery. I was “blessed” with a bottle of their small-batch rum a few months ago when I went to visit the Distillery. 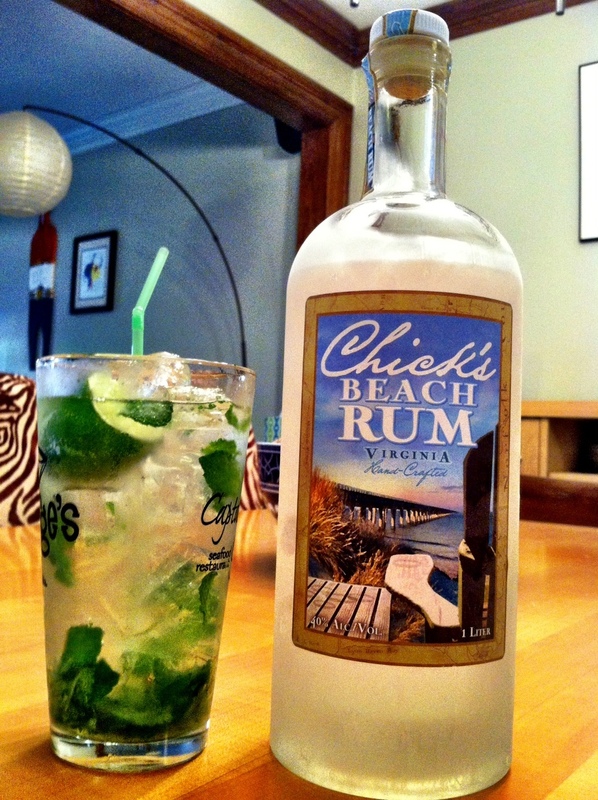 So between my backyard mint and this “Chick’s Beach” rum, this really is a local imbibe worth sharing. Snip several stems of fresh mint and muddle in the bottom of a large glass with a spoonful of raw, organic sugar and the juice of half a lime. Fill the glass with ice, then fill the glass 1/3 full with rum, then a jigger of sweetened lime juice, the juice of the other half of the lime and fill the rest of the glass with club soda. Stir well and enjoy.